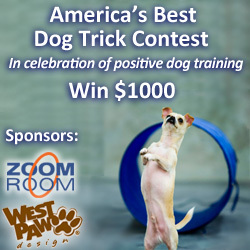 The Zoom Room Dog Agility Training Center and exclusive sponsor West Paw Design are delighted to announce the “America’s Best Dog Trick Contest” – the first nationwide dog trick contest using only positive-reinforcement dog training methods. Open to any American resident, dog owners will submit a short video of their best dog trick via the Zoom Room’s Facebook Page. Initially, anyone may vote for the Best Dog Trick on Facebook. The top five dog tricks will then face a panel of judges from the Zoom Room and West Paw to determine the winner. The first place winner will receive $1,000 plus a collection of Zogoflex toys, including a Hurley, a Huck, a Bumi, a Zisc and a Tux. Second place will receive $250 plus the collection of Zogoflex toys from West Paw. The other three finalists will each receive Honorable Mention, as well as a Bumi, a Hurley and a Zisc. While uploading the dog trick video to Facebook, each entrant will also submit an entry form attesting that the dog trick was trained using only positive-reinforcement methods such as positive praise, treats or clicker training, and that no coercive, punitive, restraint, or other forms of dominant training were used in shaping the trick. The deadline for submissions is January 15, 2010. Voting for favorite dog tricks will close on January 31, 2010. The winners will be announced on February 8, 2010. You must be an American resident, aged 18 or older. You may use only positive dog training methods. Begin your video by addressing the camera, saying hi to the Zoom Room, introducing yourself and your dog, and stating that your trick was trained using positive methods only. Videos must be under three minutes in length. No previously-published videos are permitted; you’ll need to record fresh footage, with that special greeting in the opening. Remember not to use any music in your video, unless you yourself own the rights. Export your video using any Facebook-compatible file type and encoding method. Click here for approved video formats. If you don’t already have an account on Facebook, you’ll need to create one by joining Facebook. Visit the Zoom Room Fan Page on Facebook. Click on the Contests tab. Follow the instructions for submitting your entry form and uploading your video. Tell your Facebook friends about the contest and your entry. They can view your video on the Zoom Room’s Facebook Page, under the Contests tab. Ask your friends to vote for you by clicking the Vote Now button under your video. The cash prizes ($1,000 for 1st place, $250 for 2nd place) require no description, but we’d like to tell you more about the Zogoflex line of dog toys from our exclusive sponsor, West Paw Design. Hurley – is the best of a ball, bone, and stick in one incredible design. Chew it, toss it, float it, love it. Huck – is where the game of fetch takes on a whole different bounce. Never bouncing in the same direction due to its grooved shape, it challenges your dog’s agility and quick reflexes. Bumi – is more than just a tug toy… pull it, throw it, float it, grab at the middle and shake it. It’s the active dog’s dream come true, charged with energetic fun and ready to spring into action. Zisc – durable yet pliable that makes catching it gentle on your dog’s mouth and easy to pick up from a hard surface. Flies fast and furious. Tux – lots of fun with or without treats. It’s easy to load and easy to clean. Holds biscuits for easy retrieval or spreadable goodies for a more difficult challenge. It’s bounciful. Note: if you have a large breed dog and are one of our winners, you’ll receive large Zogoflex toys; if you have a small breed dog and win, you’ll receive small Zogoflex toys. The Zoom Room Dog Agility Training Center & Canine Social Club is an eco-friendly, active lifestyle dog training center that practices only positive-reinforcement dog training methods. The Zoom Room is the only brick-and-mortar dog training franchise in America and the first dog agility franchise in the world. In addition to dog agility, the Zoom Room offers obedience, puppy preschool, dog tricks training, therapy dog classes, and much more. As a Canine Social Club, the Zoom Room is the perfect place to host an unforgettable dog birthday party, Bark Mitzvah, our famous Doggy Disco® Nights, or a charity fund-raiser. We carry only the finest and most Earth-friendly stuff for dogs, including many of West Paw’s great products. Zoom Room dogs and their owners are especially fond of the EcoNap – a super-comfy dog mat made from recycled soda pop bottles! At West Paw Design we believe in providing the best for your pet while balancing what is right for our environment. We search high and low for the best, most sustainable material there is to offer – we use recyclable and organic material in our bedding and toys. Recycled material is used throughout all of our beds and toys. We use premium 100% recycled IntelliLoft™ long-staple fill in all our stuffed beds. Made from post-consumer recycled plastic bottles, IntelliLoft is friendly to the environment without sacrificing our high quality standards. Our exclusive IntelliLoft™ fiber fill diverts over 200 tons of plastic bottles from landfills every year! Not only do we use recycled plastic bottles in our fill, we also offer stylish, durable Eco Friendly fabric that is made from re-engineered IntelliLoft™ fibers in our Eco Nap® and Eco Toys. The fabric itself is made from 85% post-consumer recycled plastic bottles – who knew soda pop bottles could be so soft?! Organic products and services have become a large trend in today’s market – and West Paw Design is in the forefront for bringing organic cotton bedding and organic catnip to our four-legged friends. We offer pillow beds made from cotton that has been grown free from pesticides and chemical fertilizers and all of our cat toys feature U.S. grown organic catnip – offering a healthy alternative for your best friend and the environment. Discover our unique, world-class pet products at westpawdesign.com.